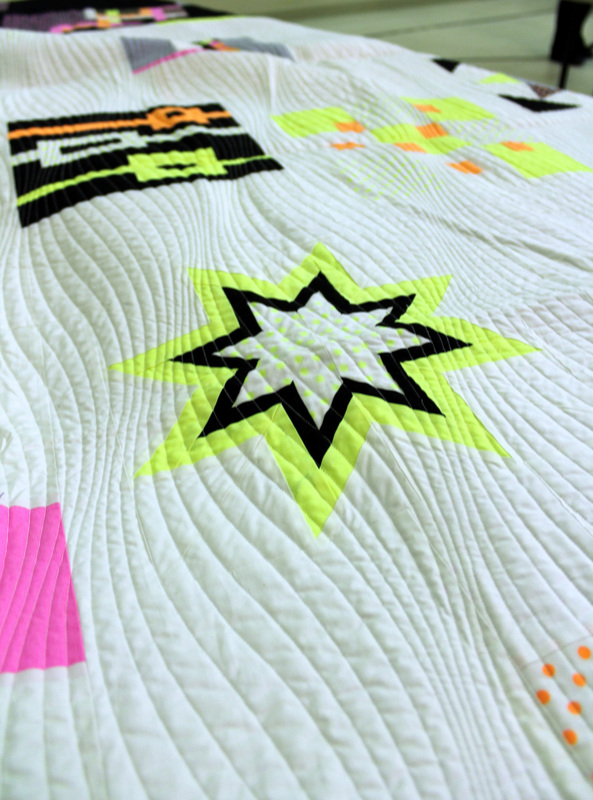 but I finally got to meet in person the quilt that the Portland Modern Quilt Guild did as part of our Michael Miller Neon challenge. 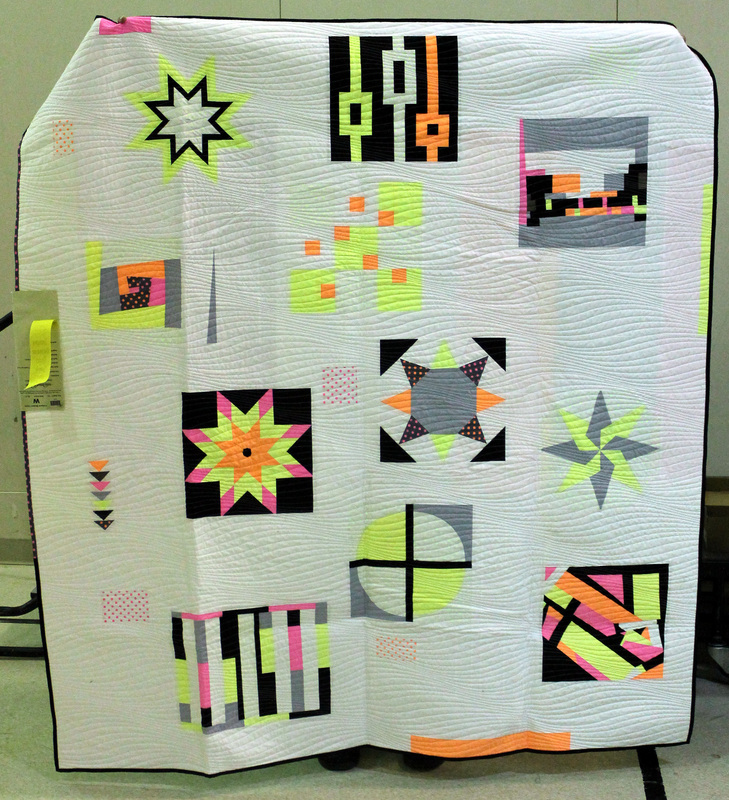 I had heard rumors about the quilt and seen a small photo of it on the Michael Miller site but that was it, until last week. So modern. So bright. So fun. 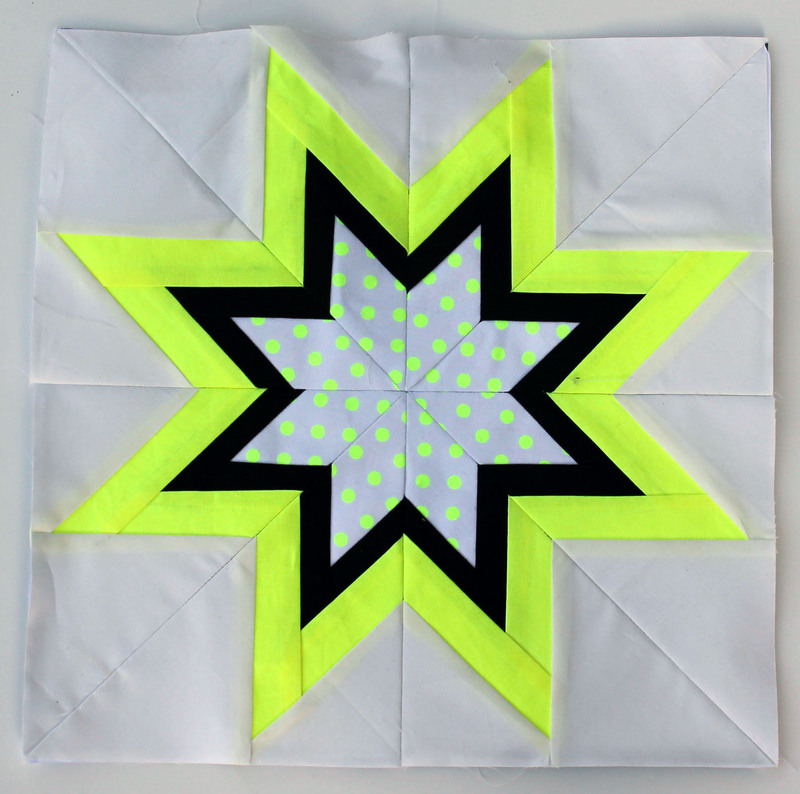 Yep my star had joined a number of other beautiful blocks, including my friend Lisa’s gorgeous improv block to become this quilt. I really love how all the random blocks are made to work with this unique layout. Amber Wilson, a PMQG member did an amazing job piecing the top and Nancy Stoval’s quilting is just perfect, as always. This quilt has been traveling a bit. 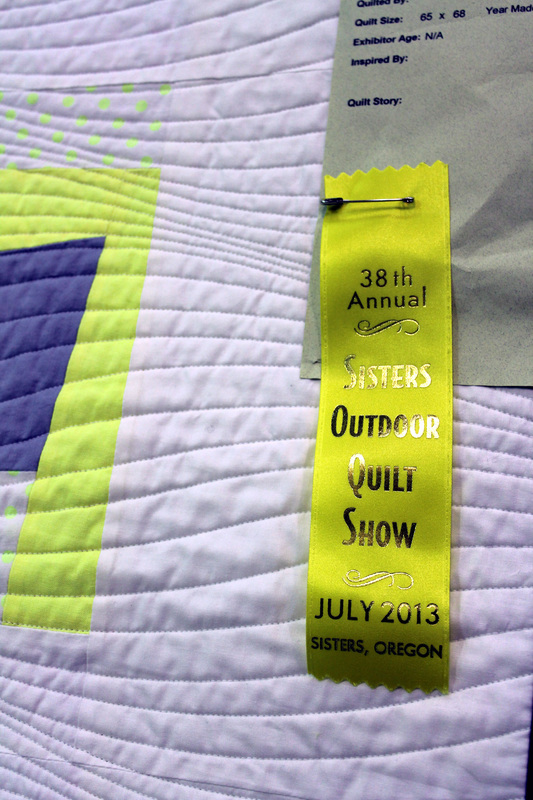 It was featured at the Michael Miller booth at Quilt Market in May and then was shown at the Sisters Outdoor show in summer. I am so very proud of my little block and it’ place on this beautiful quilt. ps. Please excuse the photos… I had to grab photos when I could but I had to share…I just had to. The colors are so so not my style, but I know they appeal to others! 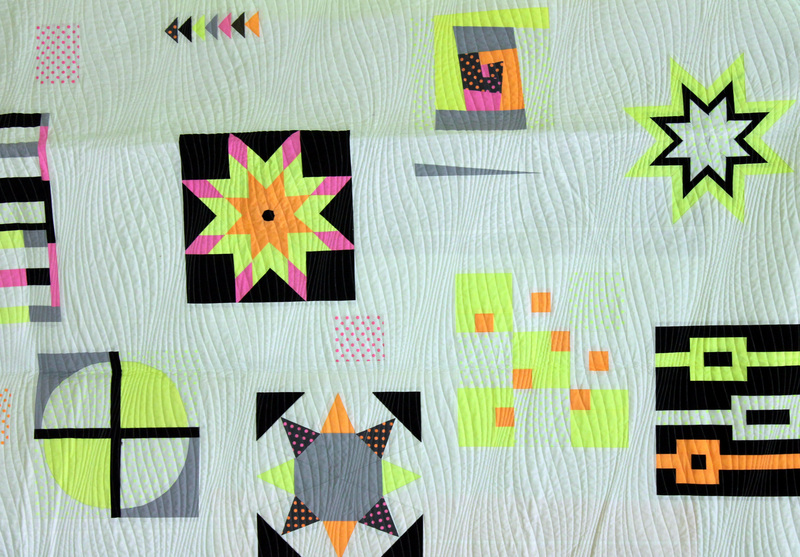 The blocks are all lovely and work really well together, and I love the quilting on it. What a fun quilt to be a part of! 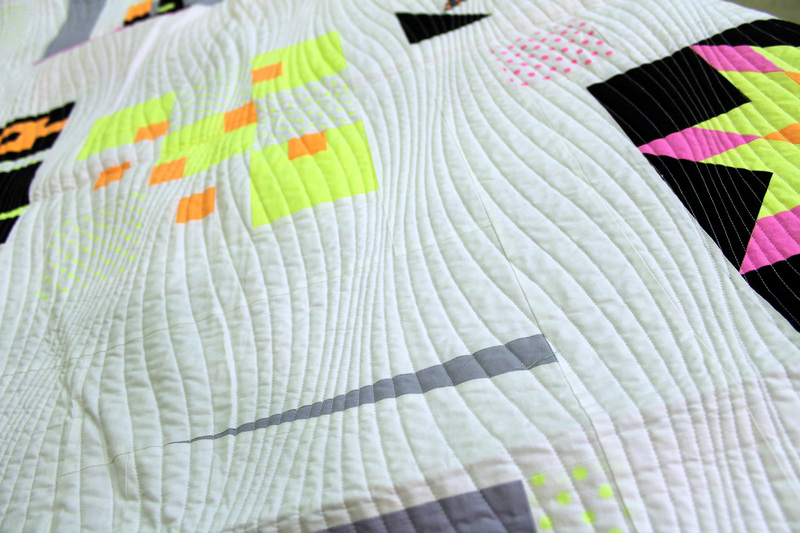 I love the layout of this quilt. Loved that block before but I love it in the final product!! Wow! Love your block, love the quilt, what a great idea and brilliant execution. Congratulations on being part of this spectacular piece of work. What a great quilt! Award worthy for sure! So fun you are a part of it. Just love the fun colors. Oh that is nothing like anything I’ve made…yet! I love it! So modern and fresh! A teenager would love that colour scheme, hmm, do I know any teenagers…. Woah, I’m having flash backs to the ’80s. I love it. The quilt looks great! As well as your block; you should be proud. Oh I love the neon orange. I bought extra of the orange I loved it so much. I still have not worked out what to do with it yet, I am waiting patiently for inspiration.